Building projects frequently present unique challenges on the long road to completion. When success is achieved, Region construction and engineering firms highlight their best projects on their websites. There they describe the specific challenges presented and the innovative solutions they developed. The hope is, professionals say, by overcoming complicated hurdles to complete a job on time and either on or below budget, the touting of their successes can open doors to new business. Larson-Danielson Construction took on the challenging project of demolishing and rebuilding the travel plazas for Indiana Toll Road Concession Co./Sunoco along the Interstate 80/90 Toll Road. Beginning in fall 2016 and completing in late spring 2018, Larson-Danielson built a total of eight plazas that stretched from Portage, Rolling Prairie, Elkhart to Howe. The ITRCC spent roughly $70 million on the entire plaza replacement project. The Larson-Danielson total construction project budget was $42.5 million. Lockwood says that one of the major challenges was a tight timeline for demolition, construction and completion. Demolition and construction of the Howe travel plazas began in September 2016 and finished in July 2017. The Howe travel plazas are both about 15,000 square feet. Construction of the new Sunoco Portage travel plazas began in November 2016 and was completed in April 2017. The Portage travel plazas are both about 6,500 square feet. The ITRCC Rolling Prairie travel plazas began in April 2017 and were finished in December 2017. The plazas are about 17,900 square feet. The Sunoco Elkhart travel plazas began in January 2018 and finished in June that same year. The plazas are both about 5,000 square feet. He said these long-term partnerships were key to getting projects done on time. “(They) understand our approach and are fully on board to tackle high-profile fast-tracked projects like these and make them a success,” he said. The Toll Road project is front and center on the Larson-Danielson website at www.ldconstruction.com. 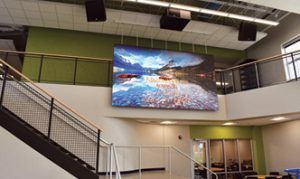 Photos of the travel plazas show off the finished product and provide a tangible example of the quality of work provided by the company. Additional portfolio photos display the projects completed in retail, institutional, industrial, health care, educational and hospitality. Each example is crafted to send out the message that Larson-Danielson can handle every type of project. 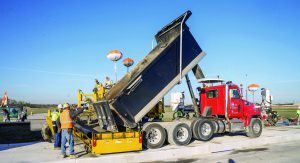 In a 30-day span between April 20 and May 10, 2018, Ozinga Ready Mix Concrete and Superior Construction teamed up on the total rebuild of a 4,000-by-150-foot main runway at the Gary/Chicago International Airport. The FAA only allows a runway to shut down for a specific amount of time, meaning timeline deviations are not allowed. Not only did the duo finish on time, they completed the work two days ahead of schedule. The success of that project resulted in both companies’ selection to perform the second phase of the runway rebuild in May 2019. The project will include removal of existing concrete and pouring 25,000 cubic yards of concrete pavement in a 12-day window beginning May 1. Superior’s bid included Ozinga’s concrete services. Dan Sopczak, Superior Construction’s Midwest president, said the team worked tirelessly to complete the project ahead of schedule and under budget. “Our attention to detail resulted in a high-quality project being completed with time to spare,” he said. Even though last year’s project was a success, lessons were learned and applied to this year’s work. Superior Construction will continue to leverage innovative solutions from last year that include a total robotic station that uses stringless paving and milling. “Our 3D stringless paving system works in conjunction with Leica (Viva) TS16 robotic total stations,” said Chris Halaburt of Superior. Sanders said last year’s production consisted of 12-hour days each of the 12 paving days. Doug Nichele, division manager for Superior, said a major success of last year’s Gary airport runway project was the efforts between the owner, design engineer, contractor, on-site inspectors, subcontractors and vendors. The websites for both Superior Construction and Ozinga showcase the results of their partnership last year at Gary Chicago International Airport. 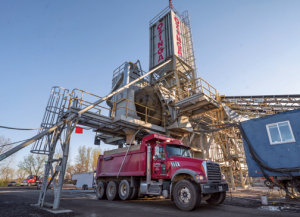 The use of robotics and mobile concrete plants brings technology to the forefront of the old-school concepts of removing and replacing concrete. Photos of the runway on both company websites provide a tangible example of the type of work provided by the two companies. The Ozinga website at www.ozinga.com presents their portfolio by advertising the various services they offer. In addition to ready-mix and specialty concretes, they share photos on materials, logistics and energy. The Superior Construction website at www.superiorconstruction.com displays photos of completed projects in the fields of petrochemical, transportation, energy, and water. 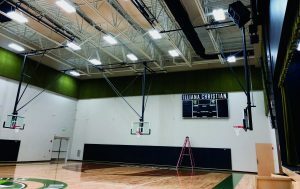 Millies Engineering Group in Munster was awarded the MEP (mechanical, electrical, plumbing) contract for the new Illiana Christian High School in unincorporated Dyer. It was the company’s 11th high school building project. Illiana Christian, a private school that wasn’t privy to public school funds, had secured more than $20 million in donations and pledges when the project began. It was unknown if they would be able to complete the stage and multipurpose room but were hopeful a plan could be designed to deal with either outcome. 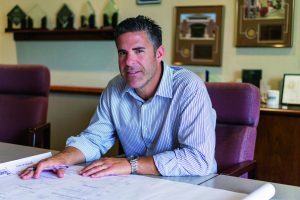 Janney and his team went to work on a design plan that had enough wiggle room to allow for completing the room now or later with minimal disruption and seamless design. An exciting reward for the Millies’ staff was based on the MEP designs they provided. They helped earn a utility grant. Illiana Christian was able to approve the completion of the room on time, and the creative designs of Millies Engineering helped make it happen. Illiana Christian was landlocked at their original Lansing location. They decided to move to Dyer in 2014 and completed the design plans in 2016. Construction began in January 2017 and finished for the 2018 school year. The first day of school was Aug. 27, and the dedication ceremony was Sept. 15. The new campus, on the corner of 109th and Calumet, sits on a 37-acre plot. It includes a 139,500-square-foot, two-story school. The design called for 210 student and 250 faculty/events parking spaces; softball, baseball and soccer/track fields; a multi-purpose field; and additional visitor parking. A commons area was designed to encourage student relationships and to contribute to collaborative learning. Janney knows that the innovative designs created by Millies Engineering Group will be an excellent selling point to future projects. “We can explain our design process to potential clients and help them create flexible plans that can be modified painlessly,” he said. The Millies Engineering Group website at www.megce.com tells the story of the diversity achieved by the engineering firm. Under the portfolio link, potential clients will find photos of projects in the fields of education, municipal, health care, entertainment, religious, and hospitality. According to Indiana Construction News, the state’s construction employment reported an 8 percent annual increase for 2018. Indiana added 11,100 jobs to employ a total of 146,200 construction workers. The U.S. Census Bureau reports that Indiana applied for more than 21,000 new housing permits in 2017, the most recent year that statistics are available. The increase in employment, building permits and number of commercial projects indicates that the advertisement of web portfolios is a productive tool in the companies’ marketing toolbox.